Dr Blood's Video Vault: The return of the Video Vault A-Z! The return of the Video Vault A-Z! It's been a long time coming but I've finally reached the stage where I can now rewatch every horror film in my "Video Vault" and review them. That means that I will probably be posting a couple of reviews each day in alphabetical order all the way through the Spring and Summer. Although I still haven't really completely finished the "New Reviews" section of this blog, I'll add the dozen or so that are left at weekends when nobody is looking. As far as I know, the only new horror film to watch out for this year is "Scream 4" and I'm done with that franchise anyway. 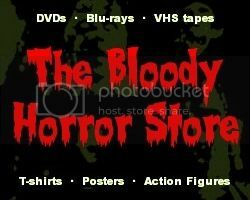 "In light of the horror season, we thought Dr Blood's Video Vault was another exciting time killer (hehe). This site is designed to pack you full of horror knowledge, including how to survive scary situations based on films. It offers film reviews, interviews and downloads, with a quiz to test how much you really know about scary movies. It also provides an A-Z list of the best-known horrors, so you'll know exactly what to rent for your scary sleepover." Well, I'm obviously a long way from achieving my former glory with what I've done on Blogger so far but, hopefully, by Hallowe'en 2011, everything will be back to how it should be. Some entries in the Video Vault will probably be moving into other sections on this site and a few more will take their place. Tastes change as you get older and nostalgia is something to be very wary of. Horror films that I used to like are probably pretty tame in comparison to what I have been watching recently. I want you to leave me lots of comments about whether or not you agree with what I have to say. Remember that I do this for free, I don't make any money from this site, and, basically, it's all just my sick and twisted hobby.